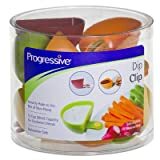 These cool new Dip Clips are mini bowls that clip onto almost any plate to keep dips, sauces, dressings, syrups, and other condiments cleanly separate from the food on the plate. They come in a set of 4 in assorted colors. I suggest clipping all four onto a plate for the ultimate in flavor dipping selection without them all weirdly merging on the plate.